1. Start LINE and tap Sign up. 2. Confirm the Terms and Conditions of Use at the bottom of the screen. 3. Select your country, enter your phone number, and tap Next. 4. Tap OK to receive a verification text message. 5. Enter the verification code you received via text message and tap NEXT. - On some devices, the verification code you receive via text message is entered automatically. - On some devices, only the Call me instead option is available to verify the account. 6. Enter a display name and set a profile photo. 7. Select whether or not to add friends from your contacts, then tap Register. 8. Choose whether or not to register an email address. Note: You will need to enter an email address if you decide to transfer your account, so we recommend registering one. If you are not receiving the verification code through SMS, please try resending it or verify using the automated call verification option. You can also verify using your Facebook account. Call Me Instead is another option you can use to verify your phone number. Please try the following steps if you are unable to receive the verification SMS when verifying your phone number. By performing the following, you will be provided with a 4 digit verification code from the on call guidance. 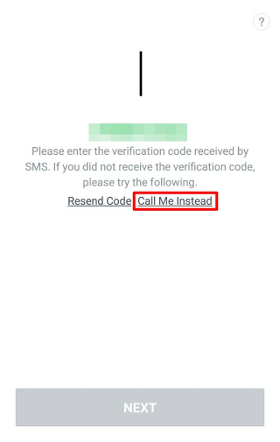 If Call Me Instead does not appear, it means that verification of your phone number was automatically completed or this option is not available to you. 1. Start LINE and tap Log in or Sign up. 2. Select your country and enter your phone number, then tap Next. 3. On the Registration screen, tap Call Me Instead. You will receive a phone call to the phone number you entered. 4. Enter the 4 digit verification code provided by the on call guidance and tap Next. If your phone is lost or stolen, please do the following. Please note that to do steps 2 and 3, you will need a mobile device on which you can install LINE. 1. Contact your mobile service carrier. Inform your mobile service carrier of your situation and have them suspend your phone number or remotely lock your phone. 2. Transfer your LINE account. LINE allows you to remotely retrieve the LINE account on your lost or stolen phone. To do so, you will have to Transfer the account. Please see the following article on how to do so. The LINE app for smartphones does not allow the same account to be accessed by multiple devices. Therefore, if you install LINE on another device and log in to it using the information of the account on your lost phone, the account will become unavailable on your lost phone automatically. 3. Verify again using the same phone number. If you cannot transfer your account using step 2, you can remotely disable your LINE account by verifying a new account using the same phone number used on the lost or stolen device. If you are verified using Facebook instead of a phone number, please use step 2 instead. For more details on creating a new account using phone number verification (and disabling the account on your lost or stolen device), please see the following article. By deleting your account, all data associated with it, such as your purchased items, LINE Coins, phone number registered to LINE, friends and groups list, chat history, and registration with integrated apps (such as LINE GAME and LINE PLAY), will be deleted and cannot be restored. 4. Disable the account forcefully. Accounts verified using phone numbers can be disabled forcefully. If you want us to do so, please inquire with us so we can provide you with a list of the documents required. Unfortunately there is no way to check your password that will be required to transfer your account. 2. Tap Forgot your password? 3. Enter the email address that was registered to your LINE account. 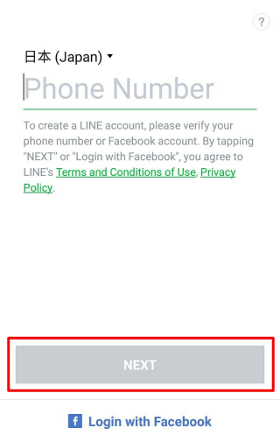 To continue using your existing LINE account after changing to a new device, you need to have either registered an email address or linked it with a Facebook account on your previous device. If you are unable to verify your account using SMS or a phone call, you can also use your Facebook account. 1. Install LINE and tap Sign up on the initial start-up screen. 2. Tap Login with Facebook. Before transferring your LINE account, please link your Facebook account to it and turn the Allow account transfer setting ON. 1. Install and start LINE, then tap Log in on the first screen that opens. 2. Tap Log in with Facebook. 4. On the message saying "You previously logged in to LINE with Facebook," tap Continue. Note: In some cases, this screen will not appear. 6. On the message saying "Another device is already using this account," tap Delete & continue. Note: If you're asked to register an email address, please do so. A phone number registration screen will appear; please choose whether to register one. If you see error messages saying you have entered an invalid email address/password or you have not registered your email address with LINE or to enter your email address correctly, please check the following. - Did you enter any extra spaces? - Did you enter everything in half-width characters? - Did you enter an email address that you are using for a different service? - Did you enter in your password correctly? If you are still getting errors after checking the above, please follow the steps below to reset your password. 1. Tap Log in > Forgot your password? 2. Enter the email addressed you registered on LINE. Before transferring your account, please register an email address to it. 2. Enter the email address and password registered on your previous device and tap OK. If you cannot recall your email address when changing to a new device or reinstalling the app, you will not be able to use it to transfer your account. If your LINE account is linked to a Facebook account, you can use it to transfer your account. You can transfer your LINE account by registering an email address. 1. From the main menu, tap the Friends or More tab > Settings > Account > Email address. 2. Enter an email address and password, then tap OK.
3. Enter the verification code or tap the URL in the email that was sent to you.